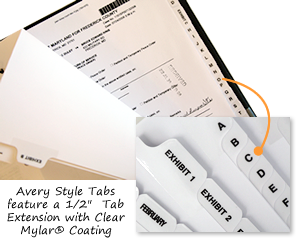 Keep your legal documents sorted with our Avery style legal tabs. Ideal for legal departments of big corporation firms, libraries with academic law journals, insurance firms and more, legal tabs can be used to organize paper work efficiently. We have a large inventory of tabs including numeric tabs, alpha tabs, Roman numeral tabs, exhibit tabs (both alpha and numeric), and monthly tabs, available for quick delivery! • Use for index briefs, mortgage documents, legal exhibits, or office file work. • Printed with blank ink, tab extensions are laminated with clear Mylar for additional durability. • Available 3-hole punched, with Mylar reinforced binding edges, or both! • Tabs are manufactured in USA. • We offer hassle-free and quick shipping on all tabs. Most orders ship within 1-2 days of purchase.